On November 26th Tomorrows Thoughts Today’s Liam Young and BLDGBLOG’s Geoff Manaugh will be coordinating the next installment of their Thrilling Wonder Stories series at the Architectural Association in London. The event will also be streamed live online here from 1pm – 8pm GMT. We have always regaled ourselves with speculative stories of a day yet to come. In the polemic visions of Thrilling Wonder Stories we furnish the fictional spaces of tomorrow with objects and ideas that at the same time chronicle the contradictions, inconsistencies, flaws and frailties of the everyday. Slipping suggestively between the real and the imagined they offer a distanced view from which to survey the consequences of various social, environmental and technological scenarios. 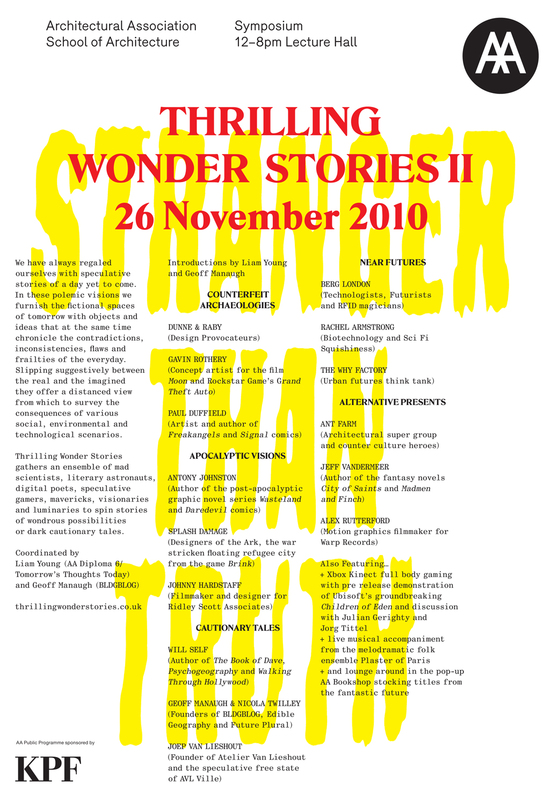 Thrilling Wonder Stories 2 gathers an ensemble of mad scientists, literary astronauts, digital poets, speculative gamers, mavericks, visionaries and luminaries to spin stories of wondrous possibilities or dark cautionary tales. 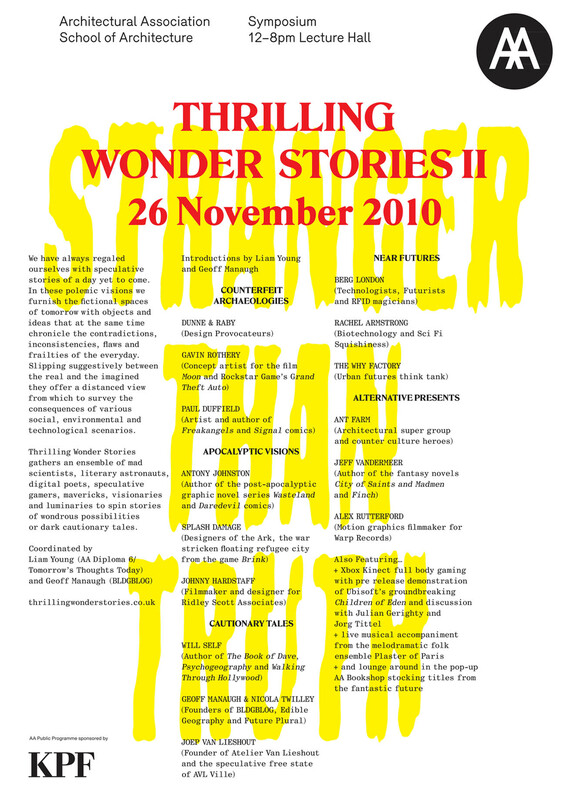 Thrilling Wonder Stories 2 follows last years event that featured Francois Roche, Peter Cook, Viktor Antonov, Warren ellis, Squint Opera, Ian Macleod and Jim Roosignol. You can watch the event in the online archive here. Both events will be novelised as a collection of illustrated future fictions to be launched with Thrilling Wonder Stories 3 in November 2011.